IN STOCK NOW: All Black ceramic. Victory "Rippers" for 2008 thru 2017 Hammer and Jackpot models. These have the 02 sensor bungs. Victory "Rippers" include heat shields, and our mini tuned cores. Comes in your choice of Triple Chrome Plate, black ceramic, or add Designer heatshields. Hacker Custom exhaust "Rippers" have been dyno proven to provide more than 10 horsepower over stock and they by far outperform Victory's Curve pipes (Victory Brand Swept pipes & X pipes LOOSE power, 2 HP less than stock pipes.. Har-Har!). The Rippers are an easy bolt on upgrade, they bolt right on the stock bracket, NO FRAME CUTTING, making our Rippers and Jokers the easiest exhaust to install available. Made in USA Rippers require the use of our AMS fuel module or a custom Victory remap. 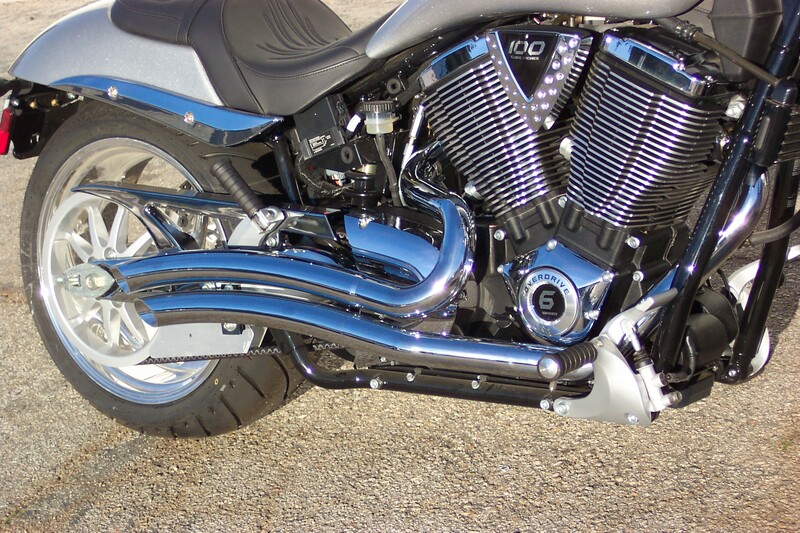 Picture shows black shields on chrome pipes, this option is available on all of our Rippers and Zoomies.